The walking idea machine is hoping the citizens of the Internet will adopt his new 10 Commandments for solving this growing–and growing!–problem. Fast Company spoke with Anderson (not by email) to learn more. 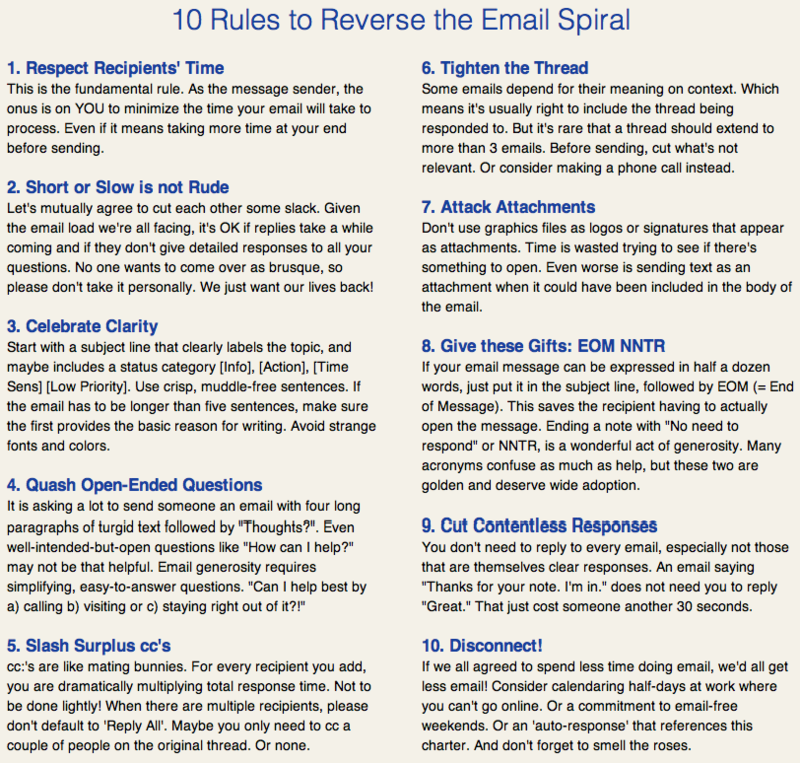 The core philosophy driving the charter is to “put in a set of rules that ensures it’s faster to process an email, on average, than it is to create it.” Anderson argues that verbose emails are often the product of insufficient thought–following the old adage attributed to Mark Twain when he once apologized to a recipient, writing, “I didn’t have time to write a short letter, so I wrote a long one instead.” More thoughtful emails will be shorter and more organized, and, hence, easier to respond to. Anderson is not the first to try spreading an email norm. Noted tech icon, Kevin Rose, once advocated a three-sentence maximum, with the help of three.sentences.es, which appendeds a simple Q&A signature at the end of each email to explain why the message appears curt. Indeed, the charter’s biggest challenge might be getting past the perception that curt or delayed emails are “rude.” Professor Judy Olson, an expert on distance-based communication and trust, at the University of California, Irvine, finds that people often misattribute delays in text-based communication as the sender not caring about them. In face-to-face communication, it’s obvious what circumstances may led someone to delay a response (they’re thinking, they had an emergency phone call, etc.). Over email, SMS, or chat, those situational and facial cues aren’t present, and we are left to ruminate over all the reasons why someone might not care about us. Not all of Anderson’s rules are terribly ambitious–some are just simple tips. Rule #7, “Attack Attachments,” shames brand-happy users from including company logos or download-intensive graphics in their emails, which forces reluctant users to sift through the barrage of images for the actual message. Another, “Slash the CC’s,” begs senders to leave tangential parties out of the conversation. Perhaps the most concrete is #8, two acronyms, EOM (end of message) and NNTR (no need to respond). EOM can be placed directly in email subjects, like “how is dinner at 5:30? (EOM),” preventing the need to even having to open the message. The ultimate solution may come from both norms and technological devices. Google’s “Priority Inbox” automatically separates emails based on who they are addressed to, if the content appears to be a mass mailing, and if there is frequent contact between the recipient and the sender–a process that attempts to become more accurate over time. So, at the very least, the most important emails can be responded to first, and the rest can be casually dealt with while watching TV. Less tolerant approaches, like the newly released Shortmail, actually rejects messages longer than 500 characters, bouncing a polite response to verbose senders. Follow Greg Ferenstein on Twitter. Also, follow Fast Company on Twitter.